Jack Henry Abbott is captured in the oil fields of Louisiana after a two-month long manhunt that began when he killed Richard Adan at the Binibon restaurant in New York City on July 18. At the time of the murder, Abbott had been out on parole largely through the efforts of author Norman Mailer, who convinced officials that he had a great writing talent. Abbott spent virtually his entire life in prison. At the age of nine, he was sent to reform school in Utah. Soon after his release nine years later, he was arrested and convicted of forgery. While serving his time at the Utah state penitentiary, Abbott killed a fellow inmate in 1966. Although he claimed to have been defending himself from a homosexual assault, he received another 14-year sentence. In 1971, Abbott escaped from jail and robbed a bank in Denver before being captured. Back in prison, he heard that Norman Mailer was writing a book about Gary Gilmore, who was on Utah’s death row, and began writing long letters to Mailer, detailing his supposed mistreatment in prison. 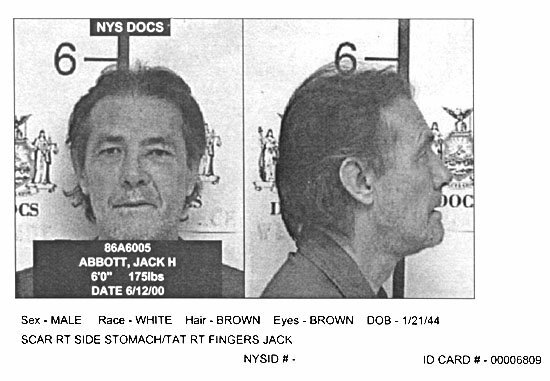 Jack Henry Abbott posed for this New York State Department of Correctional Services mug shot in June 2000. 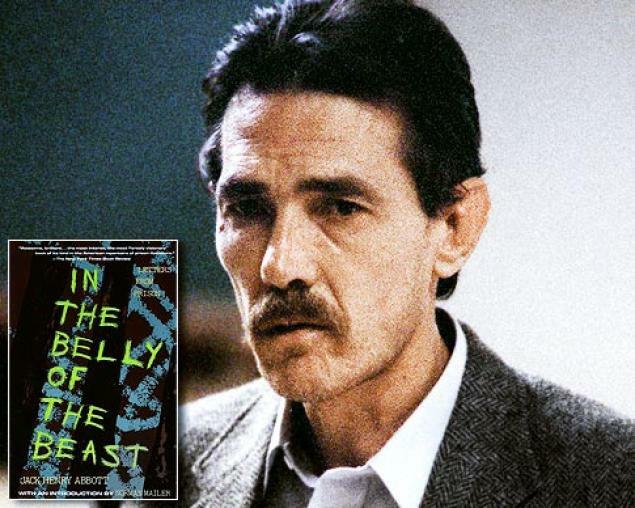 Abbott, who wrote the best selling book 'In the Belly of the Beast,' was paroled in 1981 with the help of author Norman Mailer (he had been serving time for robbery). Weeks after his release, Abbott murdered a man on a New York City street, a crime for which he was sentenced to 15 years to life in prison. Abbott committed suicide in February 2002 at the Wende Correctional Facility. Mailer, who thought Abbott was a talented writer, got the New York Review of Books to publish some of the letters. Random House then published Abbott’s book, In the Belly of the Beast. Telling prison officials that Abbott had a promising career as a writer, Mailer offered to employ him as a researcher. On June 5, 1981, Abbott was released to a halfway house in New York City. Although the New York literary crowd adopted Abbott, he found himself more comfortable among the small time crooks living in the city’s Lower East Side. Only six weeks after his parole, Abbott picked a fight with waiter Richard Adan at the Bonibon restaurant, stabbing him in the chest and killing him instantly. Abbott fled to a small Mexican village, but since he did not speak Spanish, he traveled to Louisiana, where detectives caught up with him. Back in New York, Abbott managed to get the minimum sentence for murdering Adan—15 years-to-life—in part because Mailer urged the court to be lenient. According to Mailer, “culture is worth a little risk.” Subsequently, Abbott’s notoriety grew even more, and his book became a bestseller. He committed suicide in prison on February 10, 2002.